"Monster Trophy Bucks Personal Checks" product is already in your cart. Whitetail Deer Hunters will relish the opportunity to order the Monster Trophy Bucks personal checks from Bank Checks Now. Monster Trophy Bucks don't get big and old by being dumb. Many of these Trophy Bucks grow trophy sized antlers. Boone and Crockett scores in the range of 180 to over 200 points are somewhat common. These amazing animals are very keen and smart. Once hunting pressure starts on Whitetails many large Bucks head for dense cover and hold up there for days. Deer hunters that harvest a Large Trophy Whitetail Buck that scores in the 180 point range are very fortunate, You can hunt a lifetime and never even see such a deer. 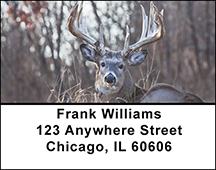 Complete your new Monster Trophy Bucks check order with matching address labels and a coordinating check book cover.